Industry and commercial roofs really take a beating. From the sun, the weather, building stresses and from acid rain and other pollutants. It takes a lot more than just waterproofing to provide long-lasting protection in these conditions. And no protective coating meets the challenge better than SWEPCO Aluminium Roof Coating. 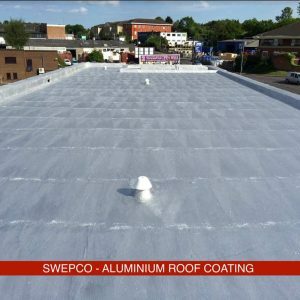 SWEPCO Aluminium Roof Coating System is a premium quality waterproofing coating which is formulated for long term service in the harshest of conditions. 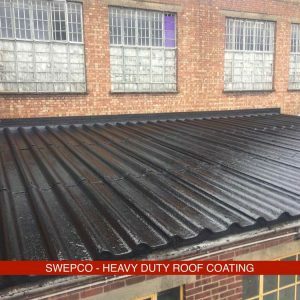 SWEPCO Aluminium Roof Coating system is a premium quality coating designed to waterproof, protect and beautify commercial and industrial roofs. It is made with pure aluminium pigments, two special asphalts, high strength micro fibres and high-quality ingredients. 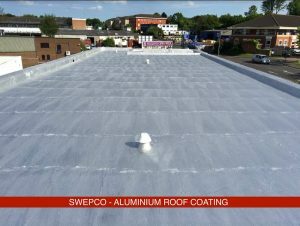 SWEPCO Aluminium Roof Coating is recommended for use over smooth asphalt, mineral granule-surfaced asphalt, gravel covered asphalt and exposed metal roofs in a wide variety of complete SWEPCO Roof Systems. It is suitable as both a maintenance coating for existing roofs and a final coating for new roofs. 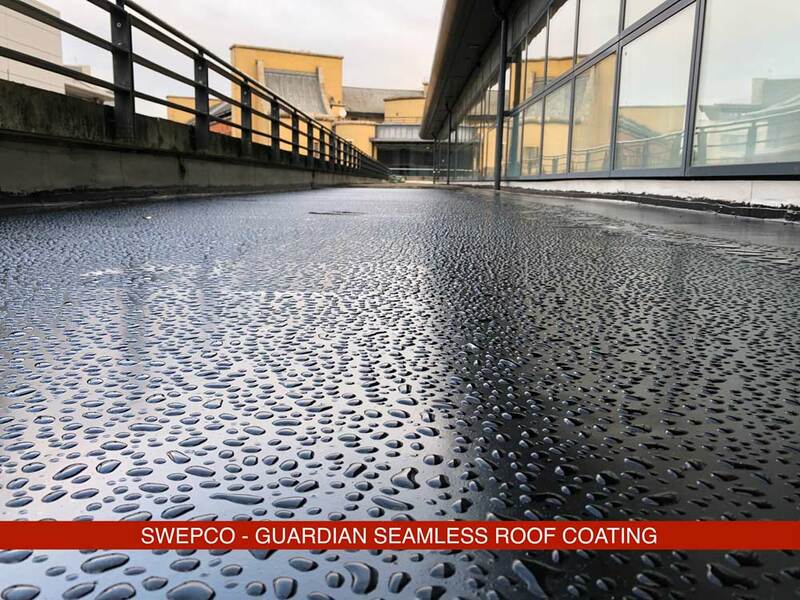 When the project calls for restoring a weathered industrial or commercial synthetic roof, no other coating provides more performance than SWEPCO Guardian Seamless Roof Coating System. Advanced polymer chemistry produces tenacious bonding to the most common weathered synthetic roofs. The result is unsurpassed waterproofing reliability and strength that stands up better to the many destructive forces at work on commercial and industrial roofs. 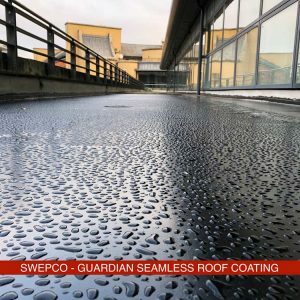 Choose SWEPCO Guardian Seamless Roof Coating System to save that old synthetic roof membrane and avoid the high costs of roof tear-off and disposal. SWEPCO Guardian Seamless Roof Coating is a black, liquid, polymer enhanced elastomeric urethane roof coating manufactured from a high solids content of premium quality polymers, urethane resins, virgin rubber, “Heart of Texas” Asphalt, finely milled blue-black slate and other proprietary chemical additives which extend performance. Excellent bond adhesion, elongation, cold flex, impact resistance, acid rain and harsh industrial environments make it ideal for use in restoring weathered synthetic roofs. Recommended for maintenance of EPDM (Rubber), PVC (Plastic), TPO (Thermoplastic Olefin), SPUF (Sprayed-in-place Polyurethane Foam), CSPE (Hypalon®), PIB (Polyisobutylene) & CPE (Chlorinated Polyethylene) roofs. It provides excellent performance in both complete waterproofing systems or as a spot repair material for seams or other trouble spots. Heavy Duty Roof Coating System is a premium quality compound, scientifically formulated to protect newer roofs or improve and rejuvenate weathered roofs. It contains the finest raw materials, combined to help your roof withstand the tortuous weathering cycle. These unique ingredients include: “Heart of Texas” Asphalt®. The primary ingredient in Heavy Duty Roof Coating, and one of the finest premium-grade waterproofing asphalts in the world. “Heart of Texas” Asphalt® is superior to other asphalts since it is refined to meet SWEPCO’s exacting performance specifications. 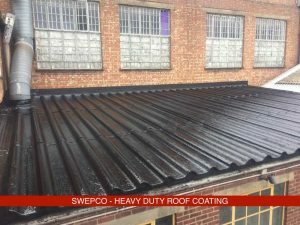 SWEPCO Heavy Duty Roof Coating System can add years to the life of weatherworn roofs that have not deteriorated badly enough to require replacement. It reconditions the roof surface by restoring flexibility and strength. It also adds vital waterproofing oils and special additives that penetrate into asphalt and roofing felts, helping to restore and preserve them. 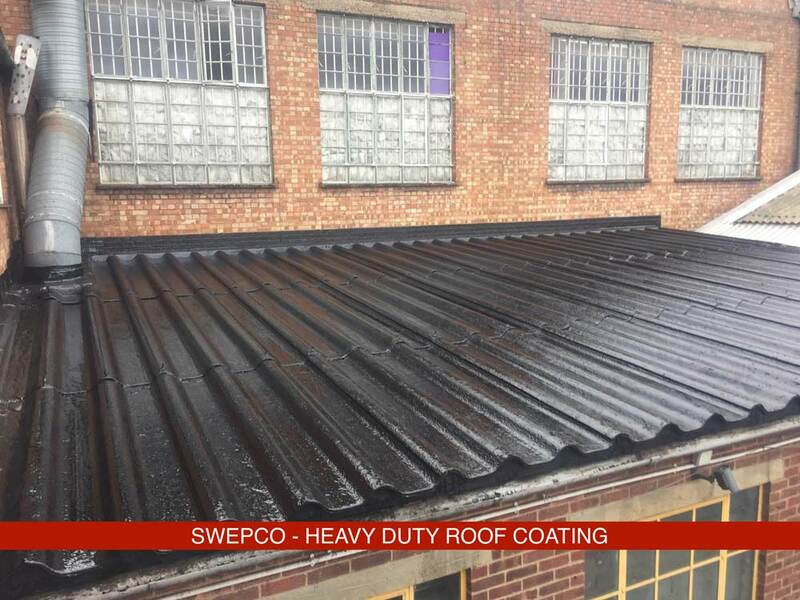 Even if your roof is in good shape, SWEPCO Heavy Duty Roof Coating Heavy Duty Roof Coating System can help. It protects new or relatively new roofs by sealing in essential waterproofing oils, preserving the roof’s resiliency for years. When industrial and commercial building owners and facility managers want their roofs to do more than just shed water, SWEPCO White Silicone Roof Coating offers a number of outstanding and unique cost-saving benefits. 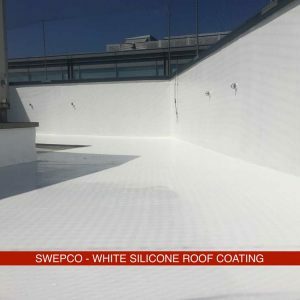 The installation of the SWEPCO White Silicone Topcoat Roof System featuring White Silicone Roof Coating creates a brilliant white, highly reflective, watertight and energy efficient roofing solution for most commercial and industrial roof types. White Silicone Roof Coating System is a one component, high solids (98%) moisture cure silicone (100%) roof coating. When applied in a minimum of two coats, creates a durable, watertight and weather resistant roof system. With no solvents and zero water content, this product will not freeze. Low water absorption will keep the product from peeling understanding water conditions. White Silicone Roof Coating System will adhere to most roof substrates without a primer. 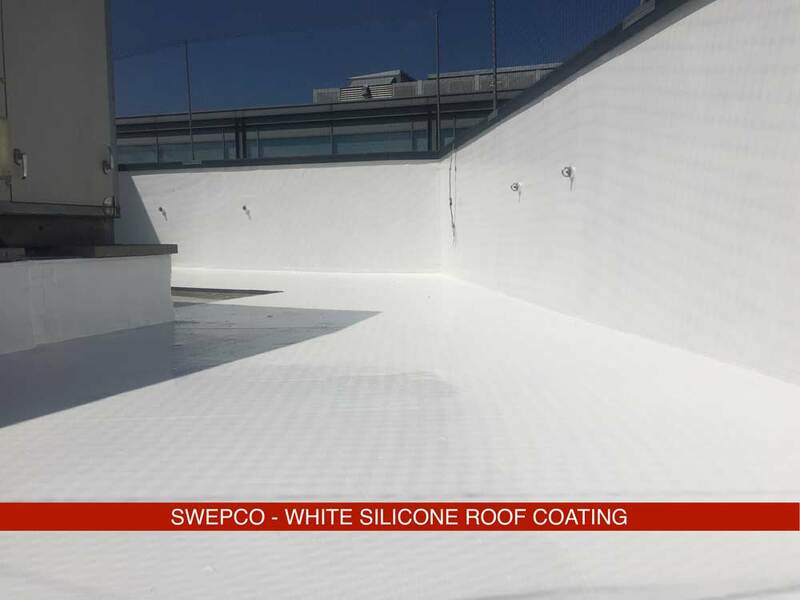 SWEPCO White Silicone Roof Coating can be applied over spray-applied polyurethane foam (SPUF), EPDM, PVC, TPO, aged acrylic coatings, concrete, asphalt BUR, smooth or granular surfaced modified bitumen and metal roofs. 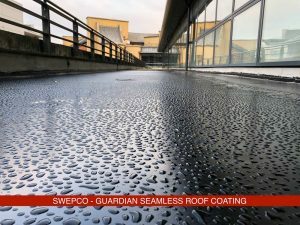 Asphalt BUR, granulated and smooth modified bitumen, and aluminium coated roofs will require SWEPCO Silicone Roof Primer for increased adhesion as well as asphalt bleed-through resistance.